Copyright © 2017 Richard Diesslin, all rights reserved. This image is copyright protected and may not be used or reproduced in any form without the expressed written permission of the owner. Permission is usually granted for local troop/pack hardcopy newsletter use, but you need to ask (it's free)! Higher resolution images (color and black-and-white) and permissions are available with purchase of the KNOTS CD. Also the KNOTS Book and/or e-Book may be of interest! Licensing rights are also available for purchase. Thanks for your interest in KNOTS cartoons and your respect for our copyrights. 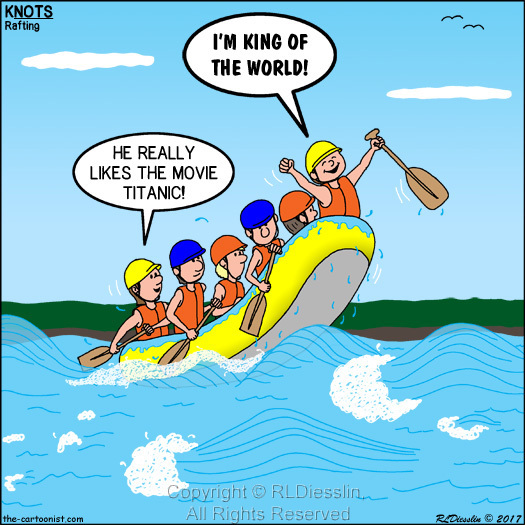 Note: KNOTS Cartoons are not affiliated with the Boy Scouts of America or any other organization. b) you have purchased the CD and meet the copyright permission requirements. Web use is granted for the link only, please do not copy the graphic onto your website - Thanks!